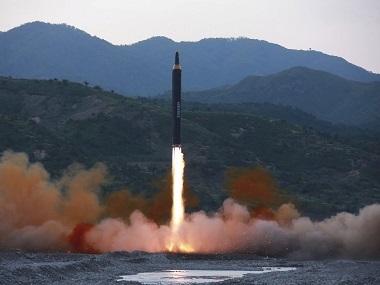 Scientists in the nuclear field of the DPRK successfully carried out an H-bomb test for ICBM in the northern nuclear test ground at 12:00 on September 3, true to the Workers' Party of Korea's plan for building a strategic nuclear force. The H-bomb test was conducted to examine and confirm the accuracy and credibility of the power control technology and the internal structural design newly introduced into manufacturing H-bomb to be placed at the payload of the ICBM. The result of the experimental measurements showed that the power specifications of a nuclear warhead, including total explosion power, fission to fusion power rate and all other physical specifications reflecting the qualitative level of two-stage thermonuclear weapon, fully complied with design figures. It was also confirmed that even though the recent test was conducted with the bomb of unprecedentedly big power, there were neither an emission through ground surface nor a leakage of radioactive materials, nor did it have any adverse impact on the surrounding ecological environment. The test re-confirmed the precision of compression technology of the first system of the H-bomb and the fission chain reaction start control technology and proved once again that the nuclear material utility rate in the first and second systems reached the levels reflected in the design. The symmetrical compression of nuclear charge, its fission detonation and high-temperature nuclear fusion ignition, and the ensuing rapidly boosting fission-fusion reactions, which are the key technologies for enhancing the nuclear fusion power of the second system of the H-bomb, were confirmed to have been realized on a high level. This proved that the directional combination structure and multi-layer radiation explosion-proof structural design of the first and second systems used for the manufacture of the H-bomb were very accurate and the light thermal radiation-resisting materials and neutron-resisting materials were rationally selected. The test helped draw a conclusion that the Korean-style analytic method and calculation programs for complicated physical processes occurring in the first and second systems were put on a high level and that the engineering structure of the H-bomb as a nuclear warhead designed on the Juche basis, including the structure of nuclear charge of the second system, was creditable. The test confirmed once again the reliability of concentration-type nuke detonation control system fully verified through nuclear warhead detonation tests and the test launches of various ballistic rockets. The perfect success in the H-bomb test for ICBM clearly proved that the Juche-based nukes of the DPRK have been put on a highly precise basis, the creditability of operation of the nuclear warhead has been fully guaranteed and the design and production technology of nuclear weapons has been put on a high level to adjust its destructive power in consideration of targets and purposes. It also marked a very significant occasion for attaining the final goal of completing the state nuclear force. The Central Committee the Workers’ Party of Korea extended warm congratulations to the scientists and technicians in the nuclear field in the northern nuclear test ground on their successful H-bomb test for ICBM.